I'll be adding more videos of my toy boxes soon, expect a Star Wars one next! UPDATE: So, I guess I never did get around to doing that Star Wars one. 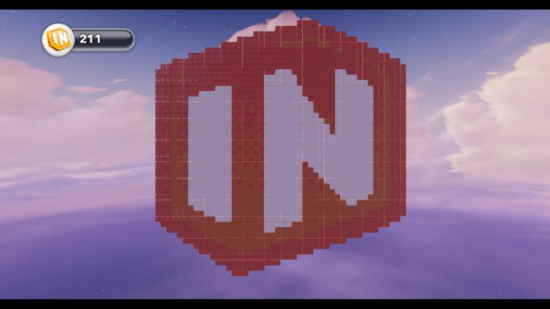 But anyways, here's some block art of the Disney Infinity logo! ...made it with blocks, and voila! Description: This Toy Box world needs your help! Get to the Evil Castle and put a stop to the villains' plans! 1 PLAYER ONLY. 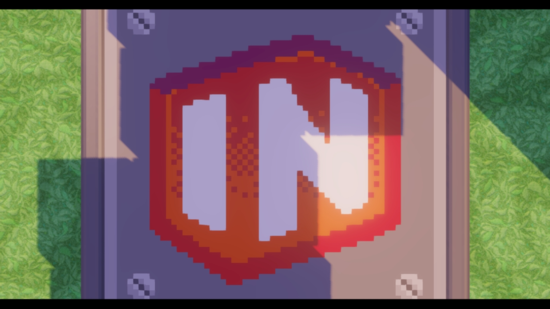 Save the Toy Box is one I made quite a while ago. 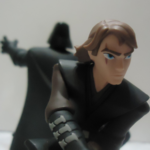 Basically, it's a mini adventure in which you have to stop a bunch of Disney bad guys at a big scary castle. I remember putting a lot of work into this one, and this was made prior to the update that somewhat fixed the townspeople, so getting Jiminy Cricket to stand still was a nightmare. (By the way, I was going to have him say "always let your conscience be your guide", you know, since he's your guide, but according to the Text Ceator, conscience is a bad word ) I also did a little experimentation with cutscenes in this too. Another thing I did that I'm kind of proud of, since I've never played another Toy Box that did this, is having players place missing items, such as a ladder or bridge or Super Cannon into the Toy Box in order to move on. I did this using the Inventory Manager, which limits the player to only the right amount of bridge or ladder pieces, and I used the Editor Manager to force the player into Build Mode after Jiminy Cricket tells you to place the item there. *It's been a while since I've played it, but I think there's a part where you're jumping on Spinners and Horizontal Movers while a Moving Wall moves in and out of your way. It worked well when I made it, but I think now that the Horizontal Mover and the Moving Wall move at the exact same time, so there's no way around the wall. If you run into this problem, just delete the wall or fly over it. Sorry! Pitch Black Maze, I guess, isn't really a maze per se, since it doesn't have any dead ends or anything, so I guess it's more of an obstacle course, but that wouldn't fit in the 16-character title limit . It features lots of moving Platforming Toys and Spike Traps, and it's actually wouldn't have been all that hard had it been in the daytime, but all the skydome is the Pitch Black Sky, and the blocks are all black to blend in with it. The tips of the Spike Traps are mostly hidden under the floor blocks, so their impossible to see in the dark. The player is provided with a Thundering Hooves Pack to get just a quick glimpse of the obstacles ahead as the glowing horse runs ahead. It was a perfect pack to use because not only does it briefly light the way, but the Spike Traps actually "kill" the horse (The spikes shoot up and the horse disappears), so you're able to tell where there will be Spike Traps. This Toy Box actually didn't take that long to make, only like two hours or less, but the end result was a challenging and satisfying maze/obstacle course! 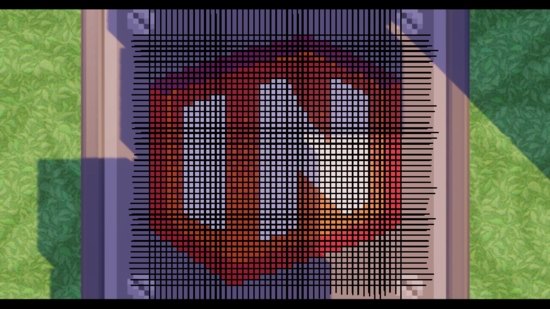 *Okay, I'll admit it, I was a bit inspired by the Toy Box "Darkness" by 7-the-Great, entered in the Puzzle Challenge! If you're reading this, great job on that! Thought I''d post a Toy Box I did quite a while ago in 2.0 and a more recent one I've done in 3.0! 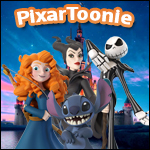 Protect Boo was a Toy Box I entered in a Disney Infinity Fans contest. The challenge was you had to protect Boo (A Lilo townsperson in a Safety Dome) from" endless waves" of Monsters University bad guys under the command of Randall for, what was it, 3 minutes? Anyways, the point is to try and defeat as many baddies as possible before time's up. I found the end result kind of boring if I'm going to be honest, but it was fun to build the Monsters Inc building. Because a contest rule was to limit the Toy Box to a specific character, I limited it to Mike Wasowski only. Description: 1 world, 30 different themes! Battle it out with your friends in any theme you choose! Anyworld is a really simple, but potentially fun-to-play Toy Box. If you and at least one other player have a hankerin' for beating the tapioca pudding out of each other, this the Toy Box to give a try! You start out in a purely white world, but when you enter the teleporter next to your starting point, you're in a room full of buttons that change the world to any non-Power Disc terrain and sky in the game. There is also a button in the center of the room that starts a challenge maker so you can fight it out and see who can get the most kills on the other player in five minutes. The world was very easy to build, but the connections for terrain-theming/sky-changing was a time-consuming job, so I hope people enjoy it! *At first, to represent the themes that the buttons change the world to, I put a plant of its theme next to each button. I didn't realize that was a bad idea until I tested a button, which themed every plant to that theme. Oops! Now instead, you have to walk up to each button and text will appear telling you what the button will theme the world to. That's really cool, I made a Minecraft version of the Theatre with the same layout as you have done there, did you enter it for the Muppets competition? No, I just made this a couple of weeks ago for fun. That was awesome! You should submit a 15 second clip for the Infinite Talents segment we are doing on the DisneyInfinity.TV Instagram! Updated 20/05/15. See original post. Updated 13/12/15. See original post.